Meet the pirates Treasure we have here! 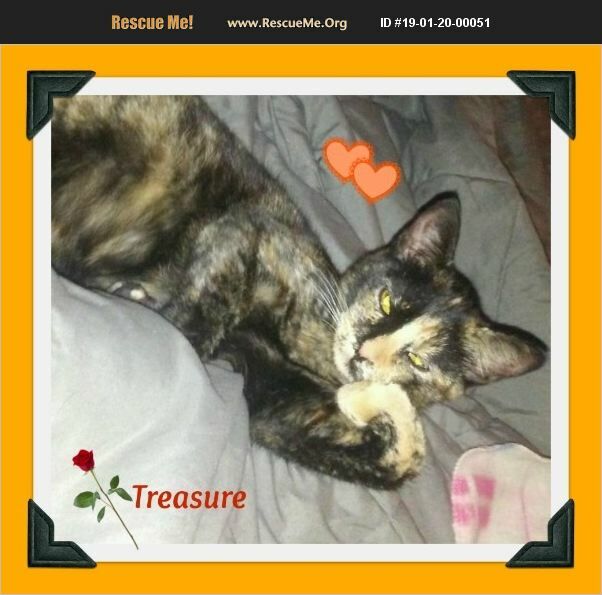 Treasure is a short haired tortie with large golden eyes that will flutter at you as you speak to her. Treasure has two blended golden toes on the left side, and on the right side rich, dark brown toes. She does silly poses as you see in this picture. She loves to make biscuits as she is a very relaxed, mellow, funny gal. She is a purr machine, a true love bug. She adores attention, and would sit in your lap all day if she is allowed. Treasure is a rare beauty with beautiful rich browns, oranges and golden colors blended together. Treasure is around 1 yr. old, spayed, combo tested negative, up to date with her rabies and FVRCP vaccinations. Opps, lets not forget she is microchipped as well! This little doll is around 6 # to 7 #'s, a smaller gal with a boat full of love to offer a lucky human caretaker. She would love a kitty tower of some sort to gaze outside, and enjoys interactive toys, little soft balls and furry mice dipped in cat nip, if you please. Please contact us, to fill out an application and we will set up a meet and greet for your next Treasure of a lifetime. We offer a two week trial adoption to make sure our cutie is a great fit in your family. We don't want you to keep her if you don't simply adore her! Thank you for visiting our rescue kitties. We appreciate you wanting to adopt one of our rescue kitties.